There’s always something I can find to love in a romantic comedy. I can always appreciate the sense of wish fulfillment, the authentic sweetness of some, or just how, well, love-able some of the characters can be. In Crazy, Stupid, Love’s case, it’s all three. Crazy Stupid Love (or “CSL” as it’s going to be known for the rest of this review) is, at times, predictable and it’s a film that by all means plays to the romantic comedy tropes, but it’s also a movie that uses those tropes to keep it familiar to it’s audience and take those tropes to the next level, setting a new standard for the genre. 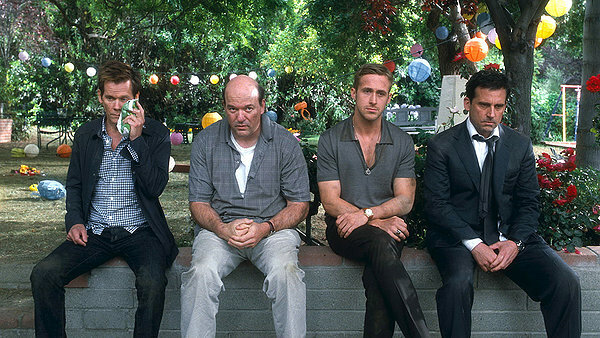 The movie follows three different stories of love, including Cal Weaver (Carell) who’s taking a passive-aggressive approach to his wife Emily’s (Moore) sudden infidelity and divorce, Jacob Palmer (Gosling) who has to deal with an entirely different approach to love when he meets “the one” (Stone), and Cal’s son (Courtney), who’s dealing with his own efforts in love trying to woo the girl of his dreams (Tipton) that also just so happens to be his babysitter. As you might can tell by the amount of last names in parenthesis, the film has one of the most impressive ensemble casts of the summer, and it uses each actor’s instinctive talent to make the film’s madly entertaining story complex even better. Steve Carell, while really still just playing up his Steve Carell shtick for the most part, still brings a great deal of emotion and comedic timing to what could have been a flat characterization, and his opposite lead Ryan Gosling has some surprisingly hilarious moments as the ladies’ man of the bar that knows all the tricks. Gosling, who’s helped out a tremendous bit by how well his character is written, really sells that charisma and goofball charm through the whole movie. Julianne Moore (who is surprisingly gorgeous to be pushing 50) also brings some life to her character, as does Emma Stone, who lends her impeccable comedic skill that we saw in Easy A to it all. Marissa Tomei briefly pops in for a handful of hysterical scenes as Cal’s first post-divorce swing, and this summer’s best bad guy Kevin Bacon appears briefly in all his smirky but inexplicably despicable glory. While the whole cast comes from very different backgrounds in an acting sense, they compliment each other admirably. The natural chemistry there that’s hard enough to nail just between two leads in any other romantic comedy is especially difficult in a six-person ensemble, but somehow CSL strikes it just right. The movie’s soundtrack is among the year’s best, hitting much like 2009’s 500 Days of Summer (another brilliant mid-summer chick flick), hitting the notes between inspirational and appropriately upbeat to accentuate the natural fun in some of the scenes where Cal’s trying to woo a new bride-to-be or Jacob’s on his merry way teaching the tricks of wooing said brides. CSL takes a unique approach to the romantic comedy with the somewhat-familiar approach of taking three seemingly unrelated stories and at the end tying them all together, teaching a different aspect of the same lesson from each one. Basically it acts as a more romantic version of an episode of Seinfeld or a less dramatized version of an episode of Scrubs. It works so well for CSL though because at the beginning of the story all three stories seem so dissimilar, and once they all do intersect in the cinematic equivalent of a train crash in the last 30 minutes of the film, you’ll start really realizing what this movie’s trying to say about the inherent insanity and the intrinsic stupidity of love and infatuation. One story’s teaching you the integrity of love, the other teaching you the persistence of it and the other educating us on love’s innate surprise at times as far as timing goes. I would have been more than willing to watch three separate films about each of these stories in one big Crazy-Stupid-Love trilogy, but I can’t say the frantic spirit of it all didn’t entertain me. The first third of the film where all these character arcs are being introduced is just a bit clunky, but as I’ve said as the movie goes on more and more that intersecting becomes more fluid and far more enjoyable. But the film doesn’t work just as an over-arching PowerPoint lesson on how love works (or doesn’t work in a lot of cases), the movie also knows how to carry its weight in the funny and the sweet moments. The whole series of events that follows Cal being trained by Jacob to be a ladies man that’s plastered all over the trailers is just as funny if not funnier than they make it out to be, and several other sequences thoroughly succeed at being tremendously hilarious or overwhelmingly sweet and romantic, if not both. There’s one particular scene in the movie where Jacob’s attempting to woo his “the one”, and instead of playing it up to romantic comedy standards of overbearing schmaltziness, it almost plays off of those types of scenes and those expectations to make a very charming scene of Jacob and Hanna beginning to fall in love. CSL is better than I thought it’d be, and that’s coming from someone who had really high expectations for the movie. Aside from being just a little predictable in spots, it’s ridiculously charming, consistently hilarious, and in the end of it all it has a terrific lesson that, in a rare occurrence for me, I actually was able to take to heart and think on. Led by a captivating cast and a script that goes beyond the romantic-comedy call of duty, as far as I’m concerned it’s set a new standard for how crazy stupid loveable a romantic comedy can be. Now that the summer’s coming to a close, a focus is returning to the more idea and character-driven stories that signal the Fall Movie Season. Rise of the Planet of the Apes definitely feels like one of those slower films that works far better when it’s working on constructing an idea than when it’s trying to deliver on blockbuster action film. In the end though it’s still a emotionally dominant and technologically remarkable film that shouldn’t be missed. The film works of course as a prequel to the classic Charleton Heston film “Planet of the Apes”, telling the story of how this ape civilization came to be. A serious chain of events transpires and snowballs out of control after a young geneticist (Franco) develops what appears to be the cure for Alzheimer’s in an attempt to cure his dying father (Lithgow). After testing the drug on an ape named Bright Eyes that goes berserk, the only living trace of the drug left is her son, Caesar, who slowly develops in both intelligent and strength faster than any of the scientists at Genysis could have imagined. James Franco, a recurring underrated actor in the Hollywood system that earned a well-deserved nomination for his incredible part carrying the movie 127 Hours, turns in some awesome work here as well. Sure, it’s not Oscar-worthy, but it’s strong enough to make his expositional scenes interesting. Brian Cox also steals a few scenes as the owner of the ape reserve Caesar’s imprisoned in during the latter half of the film. The real and only shame the film carries with its actors is Tom Felton as one of the employees at the reserve. Being as his character never really serves any purpose, as he’s never really given any depth, Felton’s “Snidely Whiplash”-esque portrayal often just doesn’t gel with the scenes it’s interlaced with, and rubs off a little annoying. John Lithgow, appearing in a few scenes as Franco’s father, absolutely steals the show every time he comes on screen. Portraying the disease of Alzheimer’s is no easy task, but Lithgow perfectly depicts the helplessness and subsequent anger that comes with it. The real beauty and majesty of this film comes in the form of its main star, Caesar the ape, played to perfection by motion capture patriarch Andy Serkis. If you’ve seen Lord of the Rings or Peter Jackson’s King Kong, you’re familiar with Serkis’ mastery of the motion capture art. The movie is worth seeing for it’s technical proficiency alone. It’s actually a genius move on Fox’s part to only spend $90 million on a film like Rise of the Planet of the Apes with there being little action set pieces in it (aside from one huge sequence at the end), allowing a majority of that money to be spent on perfecting these groundbreaking effects. There’s a shot or two that may look a little shaky, but the shots that need to work look spectacular. There are many sequences where the apes look so realistic thanks to the groundbreaking special effects that if you didn’t know any better you could be easily fooled into thinking it was all reality, especially towards the end of the film once multiple distinct apes are introduced and the special effects crew rises to the challenge of making them all unique and gorgeous. Coming down to Serkis’ performance itself, the man is an acting revolution that brings in an all-digital performance here worthy of the first Oscar nomination of it’s kind. Serkis really brings some personality to that character as he wore a motion suit on set and was really the one interacting with the other actors, and thankfully makes Caesar a living, breathing, fully developing character that becomes far more interesting than the nicely developed human characters. It’s almost realistic on a creepy level sometimes, as you can read all these emotions Serkis is bringing to the part so easily in Caesar’s eyes. The time spent developing his character both in the film and behind the scenes is time very well spent, as they’ve managed to mold one of the most startlingly engaging characters of the year. Certain things that happen to his character at the end of the movie will make you sympathize with him and his righteous cause, which is really remarkable considering some of the more villainous things that occur during the last 30 minutes. While I am very thankful Rise of the Planet of the Apes chooses to be a movie that spends a lot of time (especially in the second half) developing its ape characters, there are a few smaller missed opportunities with its human characters. We spend plenty of time with James Franco’s character in the first half and how his relationship grows with both his father and Caesar, but leaving the film I couldn’t help but be remiss that they didn’t take that the next step further and crafted a supremely interesting arc. There’s a major event in the middle of the film regarding Lithgow’s character that’s handled very callously, and it’s just unfortunate the filmmakers didn’t choose to indulge those ideas like the father/son relationship there and more into Franco’s desire to save his father. There are also a few characters that just don’t get enough time on screen. Freida Pinto’s character as Franco’s girlfriend/wife is hardly developed at all, and as I’ve said some of the character work at the Ape Sanctuary is a little spotty. Like I said the human stuff is by no means underdeveloped, just as a fan of character-rich stories; I was just left wanting more. Also, the latter half of the film that’s mainly ape exposition and thus the cause of the lack of human interaction is time well spent as you can already tell by the heaps of praise I’ve heaped on the movie’s effects and ape character development. One of the best things about the film is how engaging it ends up being despite how uninterested I originally was in the idea of a “Planet of the Apes” prequel. Thankfully there definitely appears to have been plenty of thought, effort, and creativity carefully poured into re-inventing this series for a modern age. Being dramatically different from the original series explanation for the beginning of the ape world, it almost feels like a Nolan-ized way of approaching the concept, and that recurring love and respect for the series carries it all the way to the fantastic, ominous ending that both wraps up this entry well but also leaves plenty of room for many more interesting sequels leading up to what occurs in “Planet of the Apes”. I had heard the comparison before, but Rise of the Planet of the Apes almost does for the “Apes” series what JJ Abrams’ 2009 Star Trek did for the Star Trek series. If you’ve seen any ads for the film, you’ve seen a majority of the last 30 minutes of the film with the movie’s huge Golden Gate Bridge action sequence. Being the only really big action beat in the film, it did feel a little summer blockbuster cliché to me at times, but it definitely helps that the same action sequence is so darn impressive. From a staging, geography, or just pure exhilarating excitement standpoint, it’s hard not to be thrilled by that massive battle. There are apes climbing the towers, crawling under the bridge, and flanking from all sides. It’s by far the most amazing ape-themed action sequence I never knew I wanted this summer. Also, Rise of the Planet of the Apes works very well as a thriller. There are a few tension-filled scenes involving Caesar interacting with humans for the first time that had me on the edge of my seat, and other times in the film I was genuinely terrified of what could happen next on the screen concerning the unpredictable and often brutally violent nature of the apes. Despite a few missed character opportunities with its human characters that are more than made up for with its more apish counterparts and a finale that feels a bit too summer-blockbuster for its own good, Rise of the Planet of the Apes still ends up an excellent way to end Summer 2011. What could have been a cheap cash-in on an ancient series ends up becoming one of the biggest surprises of my summer, and definitely one of my favorites of the year. It’s the film I didn’t know I needed or didn’t believe in a thousand years I’d love, but against all odds Rise of the Planet of the Apes works exceptionally well at delivering the thrills, the technical wows, and the exceptional story beats to bring Summer 2011 to a close on a very, very high note. I’m generally a big fan of westerns, and I’ve been known to dabble in the science fiction genre from time to time. So on paper, Jon Favreau’s latest Cowboys and Aliens is a perfect fit. While I can definitely come to appreciate the general ridiculousness of it all and end up having a blast with it as the fun late summer film it is, the abundance of hands tweaking the script turns out being one of the movie’s biggest struggles. It’s not the best execution of a solid premise, but it manages to have enough fun thanks to a steady director’s hand to make it worth seeing on entertainment value alone. I think it’s fair to assume I don’t have to spend too much time explaining the premise of the movie. Jake Lonergan (Daniel Craig) wakes up in the middle of the desert, remembering nothing about who he is, where he’s from, or what the mysterious alien weapon on his wrist is. Whenever he enters into the town Absolution, he quickly runs into a crew of simple western folk, including local town mogul/cattle rancher Dollarhyde (Harrison Ford). Long story short, aliens show up, destroy half the town and kidnap their loved ones in one really long, really cool action sequence. I have to give the movie credit, with what citizens the aliens do kidnap, it’s left with a really notable cast. Sure Olivia Wilde’s really just plodding along through the whole film, but there are a few amazing performances brought by a few remarkable actors. The ever-reliable Sam Rockwell makes the “background” character Doc really shine with some fine charm, and both Clancy Brown and Keith Carradine fill in a beefy supporting cast. However as any of the movie’s posters or trailers would tell you, the real stars are Harrison Ford and Daniel Craig, Indiana Jones/Han Solo and James Bond themselves. Harrison Ford’s pretty much playing Harrison Ford here, growling his lines out and still portraying the cantankerous old man we love like the forlorn, grumpy grandfather in our own lives. I couldn’t help but giggle though at how much fun the movie has with the fact that Harrison Ford’s in it. There’s a solid 15 seconds of the movie where it’s just Ford’s character slowly turning his head and speaking dialogue where we can’t see his face, coming to reveal the cinematic legend we all know he is. Daniel Craig also makes a good impact on the screen as our titular hero Lonergan, proving to us in multiple sequences he’s one of the most indisputable action stars of our time. That being said much like a lot of Favreau’s Cowboys and Aliens, Lonergan’s a few writing sessions short of a full character. Basically all you learn about him as a character is learned in the trailer. He doesn’t know who he is, where he is, or even why there’s a bounty on his head. I’ve seen the “mysterious hero” archetype played off well before, but here it just feels a little bit like a cop-out for not actually writing personality into the character, but instead just using “he’s brooding and mysterious” as an excuse to withhold too much information from us. Once we do find out about Lonergan and uncover the mystery behind a lot of things going on behind the action in the film, it’s never exactly a poorly executed explanation; it just leaves something to be desired. It’s never lazy, but never really affecting. I almost would have preferred it had Lonergan not had amnesia, but instead started the film off with a clear goal in mind to take down the alien menace and having to convince the town-folk to join him. The same goes for a lot of the other supporting characters. The infamous “first attack scene” at night comes about 15 minutes in when we’ve only gotten a brief glimpse into these peoples’ lives and who they are, so the rest feels a little haphazard because the ground foundation wasn’t exactly assembled with the most care. It’s a lot of fun to watch these two worlds collide and see how these frontier folk react to an intergalactic conflict, but one can only fantasize about what a more emotionally connected, finer written base could have done for it. 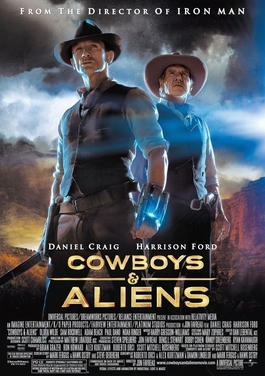 The first half of the film bounces back and forth between a real bona fide western and a more out-there science fiction movie, but it’s not until the second half when most of the action takes place that the movie really finds its groove thematically and settles into the pure, B-movie fun to be found in a film called “Cowboys and Aliens”. I was a little disappointed to see the first few moments of the film fall into place one after the other in a semi-generic, predictable way. It just sort of felt like it was just a string of unrelated sequences happening one after the other. That being said, once the second half hit, 6 year old me practically reached out at the screen seeing a cowboy just like the little plastic ones I had as a kid firing his six-shooter at a ship the size of a cattle ranch. That childish allure alone is why I think Cowboys and Aliens is worth seeing, despite a few rather large dents in the writing. Jon Favreau’s amusement-centered approach to his films like the first Iron Man and especially the holiday classic Elf was a perfect fit for this property. Favreau also has a keen eye for shooting action, something else that naturally comes in here. He seemed to have as much fun making it and plotting this all out on paper as we’ve had getting to see it all unfold on the screen. Like I said the movie definitely lives up to its B-movie style title, and there are plenty of over-the-top, worlds colliding action set pieces especially in the latter half that exceeded my wildest expectations. The final battle isn’t as epic as I had hoped, but there are plenty of fights sprinkled here and there to quench the oddest of “Aliens fighting Cowboys with the help of the Indians” thirsts. Just coming from an action enthusiasts perspective, it’s neat seeing gunfire get mixed with laser-fire, and chases between starships and horses, it’s definitely something that’s never been toyed with before. Even from a visual design standpoint, Favreau’s got it down pat. The more traditional stuff involving the town of “Absolution” looks pretty standard but still has plenty of faithful, gritty flavor, but I was more interested in how Favreau made his aliens look. All of the spaceship interior stuff has a remarkably grungy and dirty vibe, and even the ships themselves take on a more practical, task-oriented aesthetic that looks great. The aliens themselves (despite some more odd choices involving retractable, miniature arms), look like a cross between a Predator and the District 9 aliens, thankfully crafting a creature that actually looks considerably formidable and extremely frightening, even compared to the rough and gruff cowboys. All in all, I’m not going to remember Cowboys and Aliens for being Jon Favreau’s best movie, or for being the best movie of Summer 2011. It’s like the film equivalent of wish fulfillment. Have I always wanted to see cowboys and aliens square off? Of course I have, what 7-year-old TN kid hasn’t at some point on a Saturday afternoon after Batman went off for the day? Does it come with it’s problems? Yes, the writing’s wobblier than it should be, but hey, you get what you wish for. The film could have benefited a lot from a lot less hands tugging at the script, but as ludicrous as the concept is and as hard as it is to get a movie made nowadays, we should be thankful for every ridiculously-fun-star-studded-clumsily-written-action-flick-based-on-a-crazy-idea we can get.